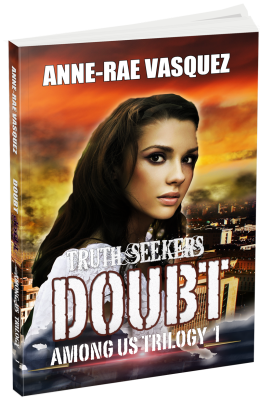 AR Publishing Inc. has announced the publication of Anne-Rae Vasquez’s latest novel Doubt, the first installment of the Among Us Trilogy series, a dystopian, paranormal urban fantasy, sci/fi, new adult fiction thriller set to be released in paperback and ebook formats on Amazon, Smashwords, Barnes & Noble, Kobo and other publishing platforms by November 13, 2013. The author uses her film making, social marketing and writing skills and love for using transmedia to help attract readers who love fringe science, gaming, paranormal, time travel and all things geeky. “Captivating, thrilling and compelling. The story is original and fresh–a definite ‘have to read’ for new adult urban fantasy fiction readers.”– Libby Howell, book reviewer “A dystopian adventure, edgy and thought-provoking which raises questions about what we’re doing to our society and planet. “International intrigue, encryptions, and clandestine arrangements tumble together in this action-packed plot as young internet gamers use their skills to investigate who, or what, is behind the catastrophic events happening around the globe, led by this season’s newest, and most brilliant, master-mind – Harry Doubt!”– Emily Hill, author of The Ghost Chaser’s Daughter and the Ghost Stories series. At 21 years old, Harry and Cristal are fresh out of university with their PhD’s. Labeled all their lives as being ‘weird’ and ‘geeky’, they find true friendships with other outcasts by playing online virtual reality games. Now they face the challenges of learning how to be comfortable with their new ‘adult’ identities. Harry Doubt, a genius programmer and creator of the popular online game ‘Truth Seekers’, has a personal mission of his own; to find his mother who went mysteriously missing while volunteering on a peacekeeping mission in Palestine. His gaming friends and followers inadvertently join in helping him find her; believing that they are on missions to find out what has happened to their own missing loved ones. During Harry’s missions, Cristal and the team of ‘Truth Seekers’ stumble upon things that make them doubt the reality of their own lives. As they get closer to the truth, they realize that there are spiritual forces among them both good and evil, but in learning this, they activate a chain of events that start the beginning of the ‘end of the world’ as they know it. The official book trailer is eye catching and produced in HD movie trailer style. Among Us is a book series which delves into the world of the supernatural and how it intersects with the everyday lives of seemingly ordinary young people as catastrophic events on earth lead to the end of times. Among Us weaves the theme of a young man and woman, Harry and Cristal, who while not fully understanding their ‘abilities’, are drawn together in their desire to find out the truth about the world they live in which is similar to themes used in J.J. Abrams’ TV shows Fringe and Lost. Film rights have been acquired by Sababa Emporium Film Productions and the movie is due to be released in 2015. Doubt, the film will be produced by Joseph Khalil. The official website AmongUs.ca interacts with visitors allowing them to participate as Truth Seekers following the theme of the story. The author comments on how she made her website interactive with her readers. Assign characters from the novel to each beta reader. Provide the beta reader with their assigned character’s strengths, weaknesses, personality traits and physical characteristics. As more chapters in the book are written, the ten beta readers will be asked to provide input with the incentive that what they write may be included in the next chapter. They will not know until the next chapter is released. Release each new chapter to the first ten fans as an award for having joined early. As more beta readers register to the site, ask them to create their own character and post the character’s 3 strengths and 3 weaknesses and 3 physical characteristics on the website. Entice additional beta readers to complete simple mission assignments related to the story with the incentive that their character may be chosen to be written into the Book 2 and Book 3 of the series. Give beta readers a Thank you credit on a Thank You page on the site and also on the credit page when the book is published. When the beta readers pass a mission assignment, a chapter will be released to them. Anne-Rae Vasquez is a freelance journalist for Digital Journal.com, author, filmmaker and web design programmer. Her latest novel, Doubt, is the the first book in the Among Us Trilogy series. Her other works include: the novel and screenplay for the award winning feature film and web series Almost a Turkish Soap Opera, Salha’s Secrets to Middle Eastern Cooking Cookbook Volume 1, Gathering Dust – a collection of poems, and Teach Yourself Great Web Design in a Week, published by Sams.net (a division of Macmillan Publishing). Almost a Turkish Soap Opera was her feature screenplay and film directorial debut. 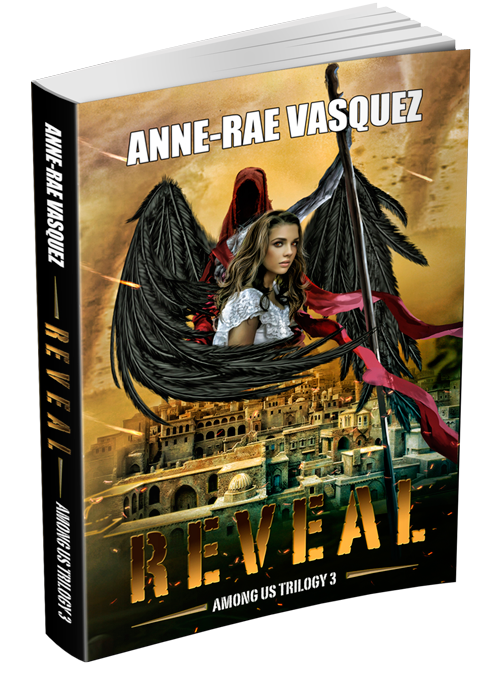 Anne-Rae Vasquez is available for interview. Among Us Trilogy, angels, anne-rae vasquez, apocalypse, apocalyptic, demons, Doubt, dystopia, dystopian, dystopian fantasy, end of the world, fantasy, fringe science, new adult, new adult fiction, Novel, paranormal, paranormal urban fantasy, press release adventure, science fiction, teen, thriller, urban fantasy, young adult. Bookmark.